Of course, in our case the dead king would be the 15s season and the new king would be 7s. With the turning of the seasons we have had a little break here at Hail Pelicus as nothing much was going on, to be honest. Congratulations to Cal as they managed to avoid a trophyless season with a victory at the CRC 7s Invitational while the stellar seasons of Life West and the Sacramento Amazons ended in finals agony. I expect very good things from these two programs in the future as they build on the success of this past season. That doesn’t mean that Hail Pelicus is devoid of things to talk about. In spite of what the talking idiots on NBC or rugbymag (rebranded as Rugby Today) says, the CRC is not a national championship. It is an invitational tournament that picks a couple of good rugby programs, adds some big name football schools and rounds it out with local teams. Why? Because NBC is only interested in ratings and selling tickets. Now don’t get me wrong – I love the CRC. It is an exciting national venue for our sport and I would have sold my brother’s left kidney to participate (pick a brother – I have three). It just isn’t a national championship. That being said, the “official” USA Rugby version isn’t a national championship either, though it comes closer. To make that tournament you have play your way in, which is why the CRC is categorized as an invitational, not a championship. The USA Rugby championship doesn’t qualify because too many teams – and too many top teams – just don’t care and don’t bother going even if they win their qualifier. So what do we have? The overall quality of teams is probably better at the CRC – the lure of TV and a professional environment is strong – but most teams are chosen based on factors aside from skill at rugby. The USA Rugby version has the correct play in format that allows for anyone to enter and qualify, but too many teams ignore it because USA Rugby is notoriously bad at organizing anything and force the teams to pay their own way. I unfortunately see this stalemate continuing for the foreseeable future. A few days ago a young rugger for the Sacramento Lions, Roy Ravana Jr, was needlessly gunned down. He was a Fijian track star who had converted to rugby and had talent and excitement reminiscent of Jovesa Naivalu, the former Fijian Olympic hurdler who represented the USA in both 7s and 15s. He was set to go to the University of Louisiana on a track and field scholarship in the fall. Our hearts go out the the Ravana family and the entire Sacramento rugby community. If you would like to donate money to help with funeral arrangements or to help out the family in their time of need go to http://sacramentolionsrugby.org/donate and click on the Paypal button. When you make your donation please put “For the Roy Ravana Fund” (or something similar) in the Message to Seller comment box so the Lions know that your donation is for this fund. Don’t forget that while the USA Eagles will be taking on the Canadian Moose Excrements June 21 in Sacramento, the NCRRS will also be holding our Annual Awards Banquet Saturday after the game. You should already have reserved your spot as the deadline for notification was June 4. If you haven’t told him already, “Smiling” Jim Crenshaw needs to know what you (and your guest) would like for dinner. The choices are: New York Steak Chicken with a mushroom sauce Broiled Salmon Vegetarian We are having it at the Delta King in Old Sacramento. The bar opens at 6 and dinner is at 7. Last but not least, the NCRRS Nor Cal Summit On The Game will be (amazingly) held in conjunction with the USA Canada match and the NCRRS Society Banquet. This Summit is a forum for best practices and principals of Coaching, Refereeing and Administration to be discussed and presented on by some of our best local assets and resources and is designed to be tailored specifically to issues surrounding Northern California rugby. Try on Rugby Year in Review – We received a grant for $30,000 from Proctor & Gamble to expand TOR. This grant sunsets in June and this video is part of our report to them, as well as our application for the coming year’s grant (we are asking for more!). Rookie Rugby – Playground to Podium is our general initiative to get folks focused on youth development as their contribution to the Olympic movement. This video is meant to show the potential for these young folks to grow up through our system and represent our country! Driving to Santa Cruz on a perfect Memorial Day Saturday was not something I looked forward to but, while longer, the meandering snake over the mountains on highway 9 was nice enough and the destination was a holiday brochure’s dream. I arrived at the UCSC campus to experience sunny skies with low to mid 70s temperatures and prepared for the first official sunburn of summer. (Over the years I have learned that sunburn can’t be avoided, only mitigated.) Some slight confusion on my part when I arrived at the rugby field to see it overrun with youth soccer players, but that was resolved when I made the hike to the upper fields. As I approached the plateau I was reassured to see goalposts creeping up over my horizon and eventually the UCSC women’s alumni game in full swing, ably managed by Pelicus Scriptoris. All was well, rugby was happening. The game itself was played in good spirits as both sides were eager to show off for the other. Unfortunately the experience and size of the alumni was too much for the students to handle and they ran in 10 tries on the afternoon. The UCSC team managed to get a well deserved try in the second half but rarely threatened to score at any other time. A great game and a social to follow – Saturday’s a rugby day. 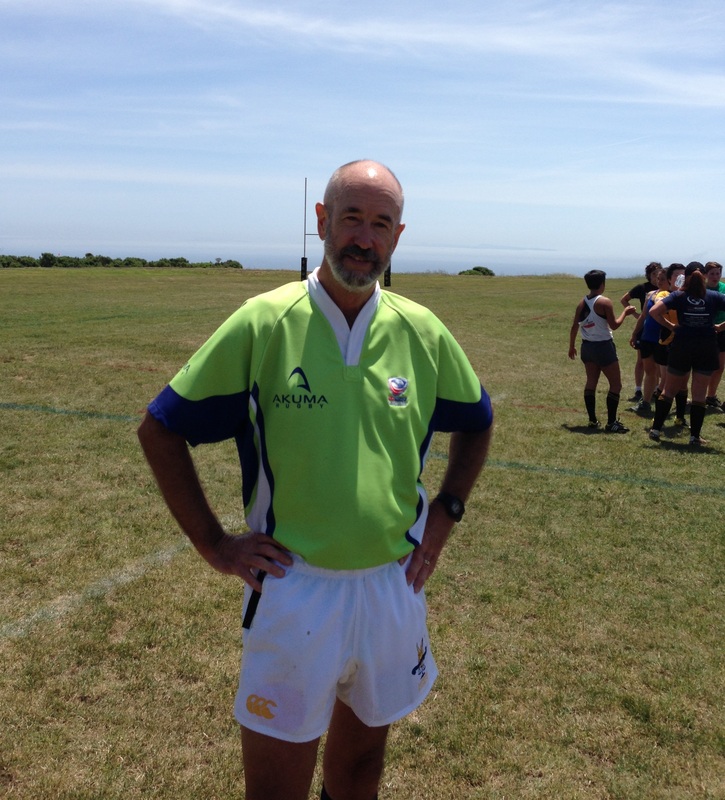 Living less than an hour from the gorgeous UCSC campus, I have refereed several games and tournaments there each year since I began refereeing in the 1980s. So it was that excitement accompanied this assignment: it would be a reunion of sorts for me as well as for the players. Another perfect day in Pelicanland. I got up at 2:19 (that’s AM, folks) when my wife was called in to work and as usual, I couldn’t get back to sleep. The early morning hours of May 24 were scheduled to host a once-in-a-lifetime viewing of the Camelopardalids so I was up and outside, reclining on the roof with a great view of the northern sky. Most named meteor showers are annual, occurring when the Earth intersects the orbits of comets or former comets. This one we normally miss, but Jupiter’s gravity has bent the track our way for once. It might not have bothered: I saw two meteorites bright enough to catch the eye in an hour, and half a dozen I would not have noticed if not already looking at their apparent point of origin. After I went inside and read for a while, it was light enough to ride my bicycle. Been training for a benefit ride around Lake Tahoe next weekend, and that means training on rugby days as well. So I got in 50 miles before breakfast – before coffee, even! This, for those who knew the younger me, is not normal behavior. By ten I had reverted to normal behavior, revving up the Pelicanmobile and heading up Highway 1, following the dreamy curve of the Monterey Bay, then ascending to the home pitch of the UC Santa Cruz Banana Slugs. The years collapse into one at such events. I speak to players I remember as if from a few months ago who graduated 3 or 4 years ago. Another player, who graduated 15 years ago, recalled playing to my whistle and I remembered her smiling face, bright disposition and positive play. Perhaps she’s one of Dilbert’s co-workers? The game was a ton of fun. The casual alumnae started slowly – fourteen players – and picked it up, with sixteen players on the pitch at one point in the second half. Phase play and rucking was pretty good on both sides, but the students’ backline dazzled with interpassing, no-look passing, unusual formations and just plain, good old-fashioned noses for the line. We all broke a sweat, worked up a thirst, and celebrated the joys of the oval ball together. Nothing like top level collegiate women’s rugby. Great game that was back and forth. Plenty of speed and intensity with easily less than 10 penalties for the game. They came to play and display their abilities and not muck about with destructive play. A real pleasure to ref!!! Pelicus Scriptorus gets photobombed by goalposts and the Pacific Ocean while trying to retain his dignity. This entry was posted in News on June 12, 2014 by James Hinkin.